Sportcal announced the results of the Global Sports Cities and Nations Index 2015 this week at the World Travel Market, London. Ireland was the highest climber overall, moving up 11 places to 49th on the Global Nations Index 2015, thanks to being awarded the World Field Archery Championships for 2016 and the Women’s Rugby World Cup (jointly with Northern Ireland, UK) in 2017. 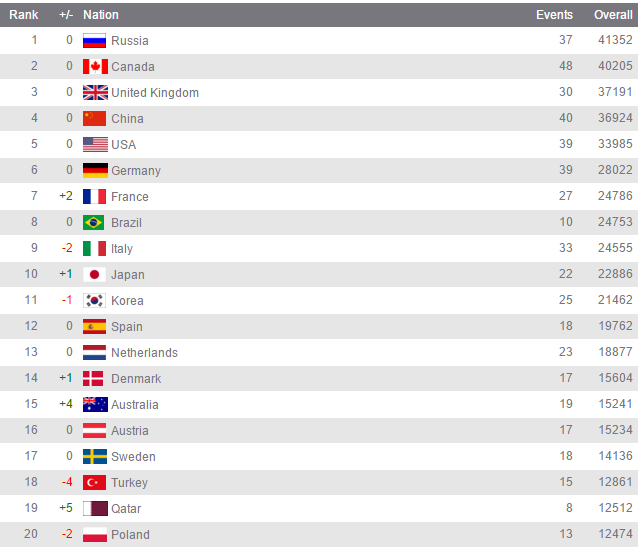 Russia has been awarded the title of top Global Sports Nation, with Canada and the United Kingdom remaining in second and third respectively. London remains the top Global Sports City for 2015, for the fourth consecutive year, ahead of Rio de Janeiro, host of next summer’s Olympic Games, and Moscow in third. The big movers on the Global Cities Index were the Gold Coast, Budapest, Beijing and Glasgow.